There are no shortages of reasons why you should have your rugs or carpet cleaned. But no matter the reason why you are calling us to clean your rugs or carpet, we have a solution to the problem. Whether Fido got sick on your Oriental rug or there is a horrid stain on the carpet, we have seen it all and we are here to help. 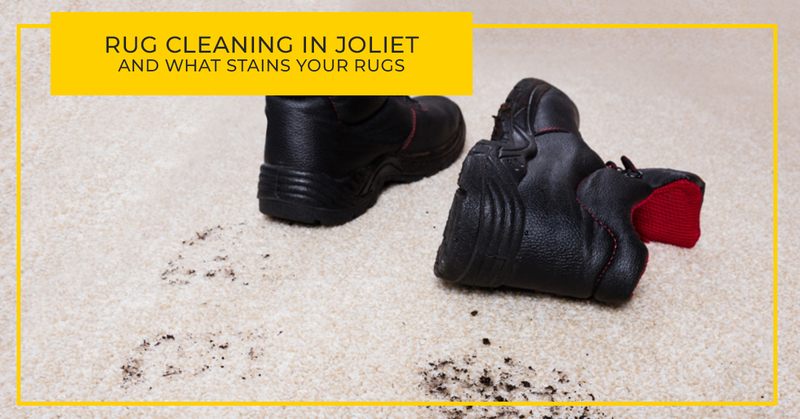 Let’s take a look at the stains that Exquisite Carpet Cleaning, your rug cleaning service in Joliet, has seen over the years. If your carpet is looking rather lackluster, it could be due to a buildup of dust. This isn’t anything to fret over, we are well aware of the proper techniques for getting your carpet clean and free from dust so it will look bright and new once again. Not only is mold on your carpet and rugs an eyesore, but it will also cause damage to them as well. It is a good thing for you that we know just how to tackle such an issue. You love Fido dearly and can’t think of a life without him. That is, until he makes a mess on the carpet and leaves some pretty nasty stains. The sooner you call us to get rid of the stain, the sooner you can forgive him and move on with your lives. There are a number of ways mud can be dragged into and through your house. The biggest culprits are usually the dog and the kids. But the husband is also known for dragging mud into the house from time to time. You just can’t teach him well enough. Mud form shoes and paws can work its way into the fibers of your carpet and cause damage. Lucky for you, we know just what it takes to get that mud out of your carpet. When there is food spilled on the carpet, it is all too easy to blame the kids. The truth of the matter is that adults are just as guilty of spilling food on the floor, they just don’t want to admit it. Remember that time your Aunt dropped an entire lasagna on the carpet as she was bringing it to the table? Good times. We can’t replace the lasagna, but we can get the carpet clean. Ink is a very stubborn stain and quite difficult to remove. You know this if you have tried to clean it out of your carpet yourself. It is a good thing that most modern inks are water soluble. There are many Millennials out there who are wondering why anybody would have ink. We have some news for you, some people still write letters. One of the problems you run into using a pen is the possibility of a leak. When this does happen, you call us. In fact, whenever you have a stain on your carpet or on a rug, feel free to give Exquisite Carpet Cleaning a call and we can help.